Starting an art collection can be intimidating. The process of purchasing artwork and starting a collection of your own often seems to be out of reach, baffling, or reserved for the elite. R/SF projects is embarking on a new series of seasonal events dubbed the Young Collectors Club (YCC). Four times a year, they will host an educational roundtable or panel discussion, along with an exhibition of ten artworks — all for sale, all priced below $1500. Inviting seasoned and emerging collectors, each iteration of the YCC presents a highly selective range of contemporary artworks and allows conversations around collecting to unfold. Installation: Marcela Pardo Ariza, Loose Attempt to a Vertical Water(bed), 2016, archival inkjet print in handmade oak and ash wood frame, 16 x 20 inches. Young Collectors Club, R/SF projects, San Francisco, April 29, 2017. Image courtesy of R/SF projects. Kathryn Barulich: Why is it important for R/SF’s community to not only experience artwork, but to collect it? What does this do for an artist’s career, for a gallery? R/SF projects: For one thing, this is larger than R/SF projects. We want to eradicate the notion that it is okay for artists to merely exhibit work for exposure while holding down second and third jobs. The work being done is extremely significant culturally and deserves compensation. Remunerating artists substantiates the idea that the work is valuable independent of its monetary worth, that it's important this work is being made now, and that we as a community benefit from its production. With the current climate in this city, we feel that it is important for us to communicate to young professionals that culture requires deep connections to its surrounding context to survive, and that includes financial support. This goes for music, fashion, etc.—if they want to truly make this community their home, they’ll have to invest in culture or it will depart for other cities. KB: This exhibition presents ten works by ten artists, that range in price and media. Something for everyone! Can you explain why these works were chosen for this exhibition program? R/SF: YCC is based on the idea that we have curated a survey of what's going on right now in the Bay Area art scene, at an affordable price range that shows point blank that art can be accessible. Instead of going to Ikea and buying furnishings, we teach interested individuals how enriching collecting can be — to engage with artists, to collect a piece on topics you feel connected with, and to know that you are supporting something truly larger than yourself. While the media certainly varies across the ten works and the prices are all $1500 or under, the artists involved are genuinely our top picks from the entire Bay Area (not all tied to our roster), so it’s an ideal place to start. Young Collectors Club, R/SF projects, San Francisco, April 29, 2017. Image courtesy of R/SF projects. KB: Can you tell me a little more about some of the pieces in the show? R/SF: Each work on view is chosen from an artist we recommend at large, whose career is rapidly expanding, and whose individual piece often reflects a brand new body of work they’re producing at the moment. So for example: Maryam Yousif is just starting to experiment with wall ceramics and we exhibited one of the very first ones, Rachelle Bussiéres had two brand new pieces born out of her recent residency in Banff in a process that’s completely new to her, and [Dissolve editor] Christopher Squier is working with fabric in entirely new ways. The 10 works aim to show collectors (new and seasoned) the possibilities out there - they're not all “easy” works in terms of display or topic, because our aim is not to simply exhibit whatever is most sellable. The series will always show some wild cards that give you a glimpse into all that is possible in collecting, but still at an affordable price range. KB: Would you describe the roundtable held prior to the public reception? What sort of conversations came about from the talk? R/SF: The round table was between our Director Lauren Licata and Rob Canali, a Canadian artist and young collector. The two of them explained the difference between acquiring one work and starting or adding to an entire collection. They also detailed the art world professionals that are at your disposal for information, such as a gallerist or an advisor, and what information to ask artists for, such as a CV. The online art market was also a big topic, how to buy work through online platforms such as Artsy, and what questions to ask, as well as the relationships at play, especially between collector and artist. Panel Discussion, Rob Canali and Lauren Licata (co-founder and Director, R/SF projects), Young Collectors Club, R/SF projects, San Francisco, April 29, 2017. Image courtesy of R/SF projects. KB: As an independent, experimental project space, how do you reach out to a larger audience outside of emerging artists and art thinkers? What do you think about the collecting community in the Bay Area - it is obviously different from those in New York, LA, Austin, etc. Who is your intended audience? R/SF: We definitely see attracting new art world audiences as a huge part of our task as a gallery. We reach out to corporations, social groups, friends of friends, people we meet on a daily basis, we’re always trying to expand who we come into contact with and how we can develop programming that attracts a large audience. The collecting community here has some amazing seasoned individuals in it, but we genuinely do believe it’s the demographic outside of the art world that has potential to get involved and to benefit from doing so. It’s definitely an endeavor we’re figuring out as we go, but when the reality is that this goal is what will keep artists here in the long run, it’s one we’re happily dedicated to. Tamra Seal, Post-Muybridge II, 2017, found rubber toy in acrylic casing, 6.5 x 15.5 x 3.5 inches. Young Collectors Club, R/SF projects, San Francisco, April 29, 2017. Image courtesy of R/SF projects. Installation: Young Collectors Club, R/SF projects, San Francisco, April 29, 2017. Image courtesy of R/SF projects. Laura Rokas, I'll Give You a Reason To Cry, 2016. Cotton embroidery floss, synthetic hair, star studs, faux fur, 8 x 15 inches, courtesy of Guerrero Gallery. Young Collectors Club, R/SF projects, San Francisco, April 29, 2017. Image courtesy of R/SF projects. Nando Alvarez-Perez, Still Life 040316/040616 (Hhoundstooth), 2016, olive wash walnut frame, plexiglass, eggshell mat board, archival pigment print, 19.5 x 25 inches. Young Collectors Club, R/SF projects, San Francisco, April 29, 2017. Image courtesy of R/SF projects. 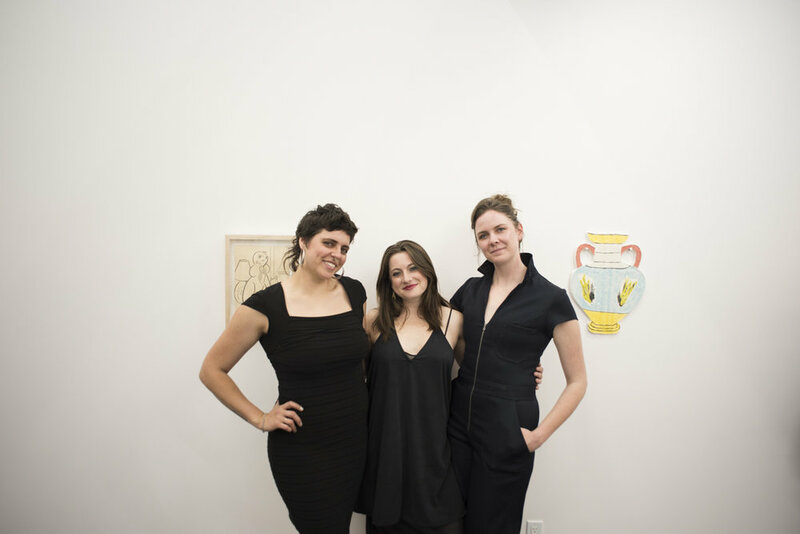 Kaitlin Trataris, Lauren Licata, and Anička Vrána-Godwin (co-founders R/SF projects), Young Collectors Club, R/SF projects, San Francisco, April 29, 2017. Image courtesy of R/SF projects. 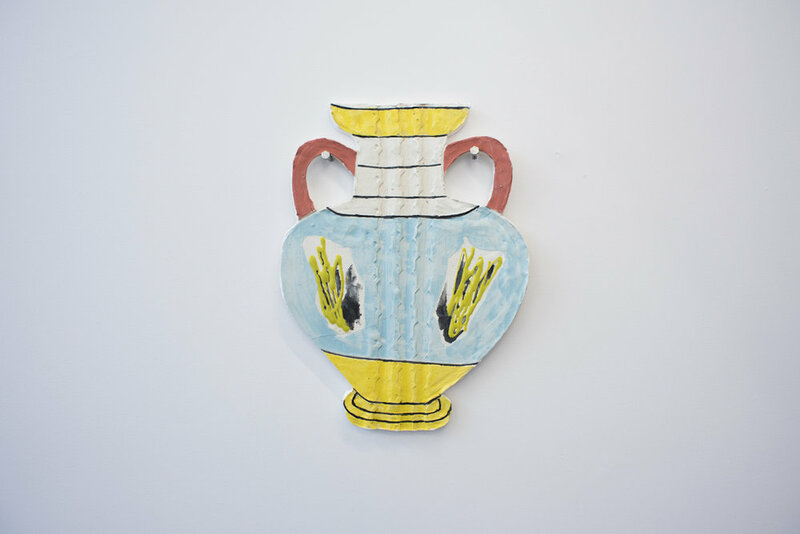 Maryam Yousif, Doesn't Hold Water, 2017, glazed ceramic wall hanging, 17 x 13 x 0.5 inches. Young Collectors Club, R/SF projects, San Francisco, April 29, 2017. Image courtesy of R/SF projects. Installation, Young Collectors Club, R/SF projects, San Francisco, April 29, 2017. Image courtesy of R/SF projects. KB: While the Bay Area is always changing, San Francisco’s art scene has been experiencing accelerated gains and losses, with the closing of many galleries in Oakland and the city because of rising rents and lack of artwork sales. When asked what San Franciscans can do to preserve accessible and cutting-edge art, Stephen Wirtz of Stephen Wirtz Gallery (closed 2014) plainly answers, “Of course, they could buy art … That would be a thought.” As an alternative art space that prioritizes ephemeral works, performance, and critical engagement - where do sales come into the equation? How do you work to make this kind of artwork accessible and saleable? R/SF: Our next show EXPAT actually highlights this exact climate, how San Francisco has lost myriad artists to Los Angeles because it is so impossible to remain here without adequate sales - and that difficulty absolutely goes for galleries as well. As you can see with YCC, it’s an enormous focus of ours to boost the collecting culture in this city, to build a self-sustaining arts ecosystem that keeps artists here. But, as you mentioned, we do also focus on the entirely unsaleable as well, which has always been an enormous part of our mission. We host countless sound and performance events, focus on new media, encourage our artists to go for the insane installation that won't necessarily sell - and we’re committed to finding ways to compensate these artists too. When there’s nothing on the walls to sell, we focus on grant funding and selling tickets at the door, which is the same game in the end - the arts have value that this community needs to invest in. Luckily, the gains that we’re currently seeing (the UNTITLED fair, Minnesota Street Projects opening, SFMOMA reopening, etc.) have convinced us that now is the time for this city to grow as an art world, so we are excited for all that is to come. KB: I am always impressed with the quality, range, and sheer volume of exciting and critical exhibitions and programs that R/SF puts on. You regularly host soirees, solo exhibitions by emerging artists, workshops, group shows, symposia, performances—how is this program different? R/SF: Ha! We definitely over-exert ourselves, and always have SOMETHING new going on - there’s always a sense that we want to make the most of our big beautiful space, and again, to diversify our programming so that its appeal is ever-broadening. YCC was definitely an experiment in throwing mud at the wall to see if it would stick - and we had no idea how it would be received. We simply recognized a need in the arts community, and felt a responsibility as gallerists to take a stab at doing something about it—and we’re happy to report that we were very pleased with the interested parties who came in, who identify as individuals looking to get involved. We will continue to do YCC as a seasonal event (4 times per year), and to continue trying out brand-new ideas as we continue expanding. KB: In general, how does the relationship work between the gallery and the artists that you represent? R/SF: We’re very close with all of our artists. Many of them we’ve already spent years with in the studio, but essentially representation is kind of like dating! We’re there to consult whenever needed, aiming to support them in whatever ways possible, be that maintaining their CV or inventory, helping with pricing, figuring out a complicated install together, editing proposals or offering letters of recommendation, even navigating their careers’ next steps. One facet that often makes us stand out is how happy we are to see our artists engaged elsewhere as well, even when we represent them, and how we contribute to helping them find these opportunities— we want them to flourish as artists, so as many people see their work as possible. KB: How do you see this quarterly Young Collector’s Club series developing? What can we look forward to in the future? Do you see this project expanding, growing? R/SF: Every season we’ll offer 10 new artists to continue showing a survey of what's happening now in contemporary art. Right now we’re focused on the best of the Bay, but eventually that could expand as well—YCC featuring art from New York, Los Angeles, etc. We hope to continue partnering with new organizations in what can be a simple happy hour in the gallery, an educational seminar, or a meet and greet, so that our audience continues to grow. And YCC will eventually become a membership-based program that involves intimate sensorial dinners, private previews of new work, studio visits—even personalized advising, collection management, and on-site installation so it definitely has room to grow. R/SF projects was founded in February 2016 in San Francisco’s Mission District as a curatorial project space for raw contemporary work, alternative projects, and offbeat programming from the Bay Area’s emerging talent. The gallery endeavors to champion true risk-taking among today’s cultural agitators, and to redefine the way viewers interact with contemporary art. The initial location hosted 46 events with over 70 collaborators in just three and a half months—situating itself as an ever-changing storefront of unconventional happenings, as well as a reinvigoration of the underground experimentation the city was once known for. R/SF has since expanded to a larger location in downtown San Francisco, amplifying its original mission to include a dynamic roster of emerging talent. Their range of cross-disciplinary practices exemplifies the gallery’s love affair with the generative nature of plurality, and imbuing art consumption with myriad points of entry. R/SF continues to incorporate intimate spur of the moment performances, sensorial artist dinners, discursive salons, and renegade projections; fixtures that entice new audiences and consistently offer new levels of critical engagement with the works on view. Kathryn Barulich, co-founder and editor of Dissolve Magazine, works as a writer, researcher, curator, gallery manager. Her research interests focus on how nationalism and language influence contemporary visual culture and politics. In 2015, she completed a Masters degree in History and Theory of Contemporary Art from San Francisco Art Institute, after studying French and Art History at Fordham University. She lives and works in the San Francisco Bay Area.